Info: This feature requires Elvis 4.0 or higher and Enterprise 8.2 and higher. Note: Integrating Elvis in Content Station can only be done in Content Station AIR, not in Content Station Web. The Elvis Content Station client combines the strength of both Elvis and Content Station. Elvis offers the interface to search and manage content while Content Station manages the publication workflow. The desktop client interface is available as a tab in Content Station allowing users to search, browse, filter, etc. in Elvis. 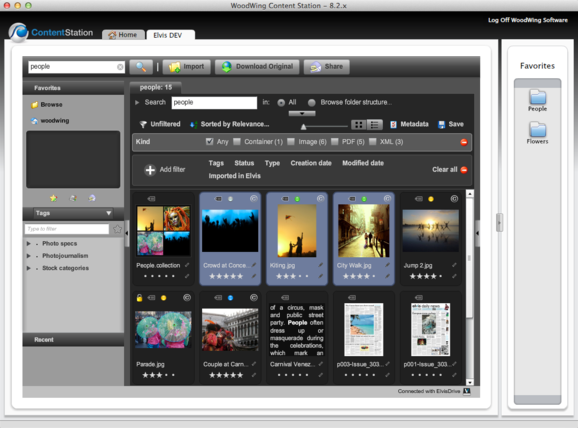 Selected files can be dragged and dropped to Content Station, for example on a Dossier in the favorites panel or on an opened tab. The files will be added to Enterprise when they are dropped. After a file is dropped in Enterprise, it behaves as any other Enterprise object. It can be used in Content Station or Smart Connection and it allows you to modify the original, change metadata or delete it. Note: The Content Source plug-in must be installed on the server in order to use the Content Station plug-in, and it can only be used in Content Station AIR, not in Content Station Web. Note: When upgrading to 4.1 from a previous version, make sure to remove the old Elvis client from Content Station and remove the remove or disable the Elvis App tag in the WWSettings.xml. You can find the subapp in <SubApps>/ElvisContentStation. Install the Content Source plug-in on the Enterprise server. In Enterprise 9 and up the option Elvis is available in the Access Profile configuration, enable this for all profiles that need the Elvis client for Content Station. The Elvis client installation and future upgrades are done automatically when Content Station is launched. Download the latest plug-in for Content Station on the community forum. If it doesn't exists yet, create a subfolder called SubApps in your Content Station folder. Extract the plug-in zip in the SubApps folder, a folder called <SubApps>/ElvisContentStation should be created. Start Content Station, double-click the Elvis icon on the home tab and start working with Elvis.